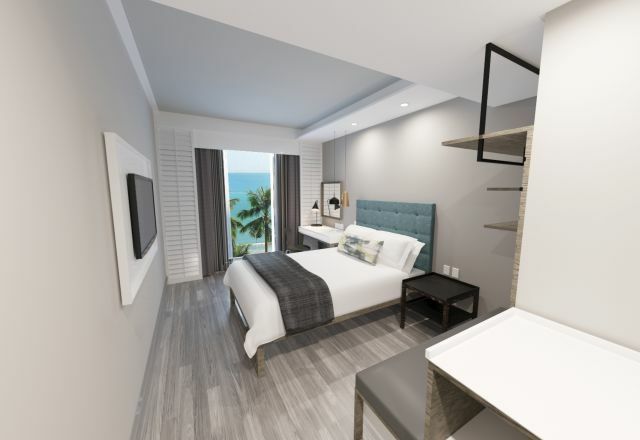 The hotel’s 125 rooms offer easy comfort, fuss-free fittings and easy-on-the-eye design with room choices that include ocean view, as well as rooms for sharing or solo travel. Rooms feature air-conditioning for climate the way you like it, en-suite bathrooms, free WiFi and enough space to unpack and work. Crisp and comfortable bedding, sound softening windows, blackout curtains and on-request wake up calls makes great sleep easy, while the work desk and WiFi makes the room a comfortable on-the-road-office. Soak in more of Maputo with a Superior Room and enjoy big windows looking out over the beach and ocean. We’ve fitted every room with a hairdryer, plenty of plug points for keeping devices fully charged, DSTV flat screen with local and international channel choices, and a safe for extra peace of mind. Coffee and tea is provided, and the bar downstairs or shop selection at Baía Mall has enough choice for any in-room snacking or drinks. Packed in a hurry and forgotten some travel essentials? Ask Reception and we’ll look after you with an amenities pack including shaving cream, disposable razor, toothpaste and toothbrush, sewing kit, nail file and body lotion. Limited mobility room available on request. Standard Rooms have an en-suite bathroom with shower, along with a host of in-room comforts to add to your stay. Superior Rooms are contemporary in style, with a sea view, an en-suite bathroom with shower, along with a host of in-room amenities.